The right curtains and draperies can complete the look and feel of your entire home. This project guide explains how to measure curtains for windows in your home. Read on for help choosing hardware location, measuring width, measuring length and finding the perfect curtain rod. First, pick the spot where you'd like your drapery to hang. Your drapery length will depend on where you want the drapery rod to be placed. If you have space, place the rod 8 inches over the window. Have the rod extend 12 inches on each side of the window, 24 inches total. Check your measurements to make sure the curtains fit inside the window opening, as they will not be able to extend past the window. Since the fabric starts at the top of your rod, start your measurement from the top of the rod and refer to rod instructions for accurate, full length draperies. Before you learn how to measure your curtain’s width, determine what kind of drapery style you want for your windows. 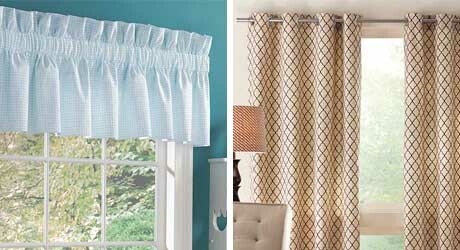 Whether you want decorative panels at the side of your window, or curtains that completely cover your window, will determine how many drapery panels you choose. The fabric you choose for custom draperies will come with the appropriate fullness; simply order the exact width that you want your draperies to cover. Side panels are styles of draperies that are not meant to close, and simply hang at the sides of your window for decoration. For side panels, simply measure how much width you want your panels to cover, and order that width. Side panels can also be collapsed to cover less space when desired. If you want your draperies to cover the entire window, you will need enough panel width to hang across the full opening. Add 12 inches to each side, 24 inches total. Take the total number (width plus the number you added to each side), and divide that number by how many drapery panels you want in the window. Make sure the number of custom drapery panels you order can cover the entire area you want covered (total width divided by panels). 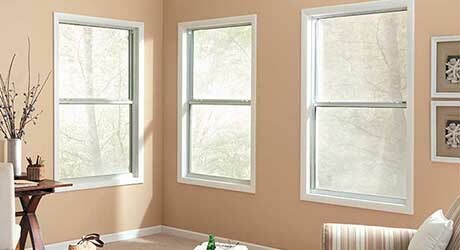 Example: For a 60-inch window with two drapery panels, add 24 inches to 60 inches (window width) and divide by 2 (number of panels) to get 42 inches. The two panels ordered each need to be at least 42 inches wide. Mark the spot where you would like to hang the drapery rod. Measure to the lowest place that you would like the fabric to hang (either the floor or the bottom of the window). This number is your Rod to Floor Height. You will need Rod to Floor Height measurements to order your draperies, but you still need to wait for your draperies to arrive before hanging your hardware. 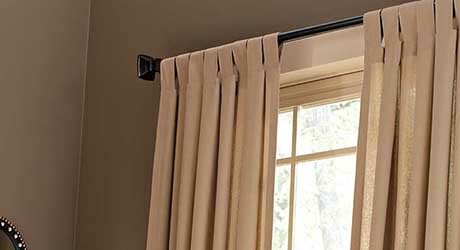 Valance style draperies can make a window appear taller, and are recommended for outside mounts. Choose a length from 10-30 inches. For a sill style curtain, order for a length that will end 3/8 inches above the window sill. We recommend sill style draperies for outside mounts, or for windows that have sills that extend past the window opening. Cafe style draperies are recommended for both inside mount or outside mount, and are most often used in kitchens. For a cafe style, choose a length that will hang 6 inches below the bottom of the window, or 3/8 inches above the window sill. It is best to place the drapery hardware around the middle of the window for this style. Apron styles are recommended for outside mounted windows, and should drape about 4-6 inches below your window sill or the bottom of your window. For floor style drapery, the length should stop 3/8 inches above your floor. We recommend this style for any drapery that might be operated frequently, and is most commonly used with outside mount. The sweep, brushing or cuff length drapery style is most often used for outside mount windows, and is useful when your room requires exact mounting, such as a ceiling mount that drapes to the floor. For this, we recommend a length that is 1-3 inches longer than your Rod to Floor measurement. Pooling or puddling style draperies are used in outside mounts when you want to hide an uneven floor or add some extra style to your look. We recommend this style if you don't open or close them regularly. For this style, add a length of 6-12 inches to your Rod to Floor measurement. Next, select a rod from which you will hang your draperies. It's important to note that your rod width will not include finials and brackets. As much as 6 inches can be added to each side of your rod due to finials and brackets. View your finial options to find the exact measurement. 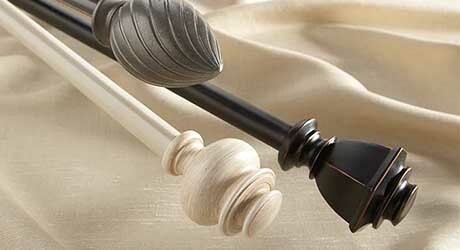 Deductions will be made in order to ensure that your rod and finials are exactly the width you order. Your draperies will not extend past your brackets.